J. Susan Isaacs, a Delaware native who is a professor of art history and the curator of the departmental galleries at Towson University in Maryland, curated “And the Word Is … ”, a new exhibit at the Gershman Y’s Gallery. Excerpt: …. Some of the most intricate and intriguing works in the show are those of Carole Kunstadt, an artist from upstate New York whom Isaacs found through the Jewish Art Salon, the New York-based group of Jewish artists and scholars. 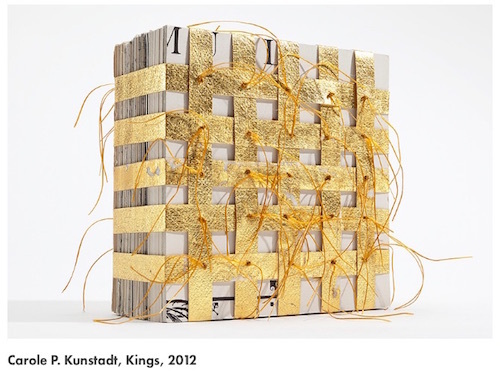 She has deconstructed the Bible to create works of paper bound with different materials, including gampi, the diaphanous Japanese tissue paper; linen thread; and 22-karat gold leaf. Kunstadt said that she has always worked with paper, but it has only been in the last nine years that she has used books in her art, including the family heirloom that forms the foundation of her contribution to the Gershman show. “This book” — a 1904 edition of the Hebrew Bible with artwork by James Tissot — “was given to my paternal grandfather by his congregation,” she said. “He was an Orthodox Jew who had a very active part in establishing the synagogue in his small Massachusetts town. When my mom’s house was sold, this book was without a home. I readily accepted it — the covers were disintegrating, but the paper was intact” enough, she added, for her to transform it….